Women are the shock absorbers of the current ecological crisis in South Africa. That crisis is rooted in the expansionist logic of capitalism. While resistance to environmental injustice is increasing, this is fragmented and there seems to be no comprehensive vision of an alternative to the current neo-liberal capitalist order. That crisis (evident in toxic pollution, water shortages, drought, warming oceans, deforestation, soaring temperatures and land degradation) is deepening. Scientists claim that southern Africa will be the worst affected from climate change, but the post-apartheid state is committed to economic growth and is expanding coal production, the main driver of climate change. Women’s role in social reproduction means they deal most directly with the damaging effects of polluted air and water, crop failures and the more extreme weather events associated with climate change. This imposes an extra burden of unpaid work on women. In rural areas black working class women have to work harder to cultivate food crops on degraded land, and everywhere they have to stretch low wages and inadequate social grants further. It is women that have to care for the ill; illnesses caused by toxic pollution of air and water from the expansion of coal mining in South Africa. Currently many poor, black communities living close to the operative coal-fired power stations and working or abandoned mines are dealing with forced removals, social dislocation and dispossession, loss of livelihoods, threats to food security, limited access to clean water, health problems associated with air pollution, violation of ancestral graves and inadequate consultation. However popular resistance to the ecological crisis generally in South Africa is weak. There is no mass-based environmental justice movement, only small, fragile initiatives. 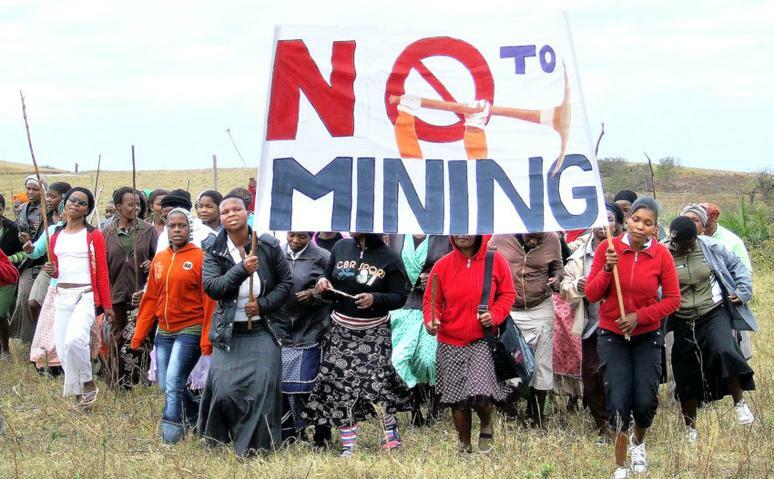 Women are the majority of people involved in resistance to the threats to their land and livelihoods from extractivism, for example, the women of Xolobeni against titanium mining, the women of Somekhele and Fulani against coal mining. Such resistance involves increasing repression, intimidation, and state violence against activists. The woman leader of resistance to titanium mining in Xolobeni, Nonhle Mathuba has received numerous death threats and the previous leader of the Amadiba Crisis Committee, Sikhosiphio Rhadebe was assassinated. Globally women environmental activists are subject to increasing violent repression with 200 killed in 2016 (The Guardian 13.7.2017). Women’s role in resistance is not rooted in any essentialist notion of their closeness to nature, but in the gendered division of labour which allocates the work of social reproduction to women. Many working class struggles in South Africa are moving beyond the point of production to the terrain of social reproduction. Much collective action framed as protests about service delivery or environmental justice are confronting lack of access to the material conditions necessary for social reproduction, such as access to clean air, water, adequate housing, land for subsistence agriculture and so on. Black, working class women constitute the majority of participants in these protests and struggles. At the same time it is largely women who are experimenting with alternatives outside the market such as practicing food sovereignty, which includes working with nature through agro-ecology, instead of the reliance on harmful pesticides and chemicals of industrial agriculture. It is largely women who are working for socially owned and democratically controlled renewable energy which works in harmony with nature, in addition to co-operative arrangements for childcare and seed-sharing to mention a few examples. These could be building blocks to an eco-socialist order. So too could forging stronger connections between the powerful feminist struggles against gender-based violence and sexual harassment to the struggles against ecological violence. Both are part and parcel of the struggle against capitalism. The articulation of a radical, black feminism in South Africa represents a decisive break from the dismissal of feminism as contaminated, as an elitist, white middle class women’s concern. But a feminism that speaks of racial and gender oppression without challenging capitalism and the class relations on which it is based, will fail.